At 10,200 ft, Leadville, Colo., is known for extremes. 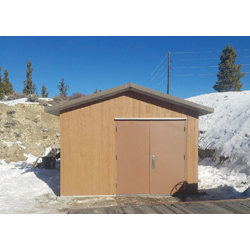 Easi-Set’s 12-by-20-ft all-concrete pump house was a suitable solution for these punishing conditions, engineered to handle 100-lb-per-sq-ft snow loads and customized with an open floor to accommodate preinstalled equipment. The winter install, overseen by the U.S. EPA, was completed in four days.